This pineapple tower symbolises Pesta Bua Kaber. THE Lun Bawangs of the highlands in northern Sarawak are blessed with lush green valleys, cool climate, and vast land to cultivate quality agricultural crops. For example, Ba Kelalan, the furthest Lun Bawang settlement in Lawas, was once known for its sweet apples and strawberries, normally grown in high-altitude places like Cameron Highlands in Pahang. The Lun Bawangs are also known for producing their own mineral salts and rice known as Adan Rice. Though the apple plantations no longer exist in Ba Kelalan, another Lun Bawang settlement in the highlands called Puneng Trusan in Long Semadoh is taking a big step towards promoting more sustainable, long-term agro-tourism, featuring their own agricultural product – pineapple. Pineapples produced in the highlands are known to be juicier and sweeter and Puneng Trusan is blessed with vast land and a cool climate to cultivate them. In fact, the Lun Bawangs have been planting pineapples for a long time but only in recent years were they able to commercialise their efforts and bring more tourists to their village to enjoy their agricultural produce through Pesta Bua Kaber or Pineapple Festival. The famous Adan Rice was sold at the festival. First organised in 2016, the festival has become an event that has attracted not only locals but also agriculture and tourism players throughout the country. 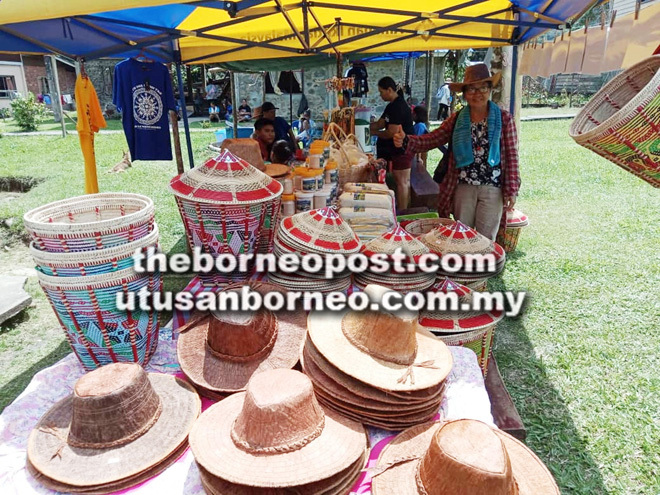 It was mooted by the Puneng Trusan village security and development committee (JKKK) with the first festival held in 2016. 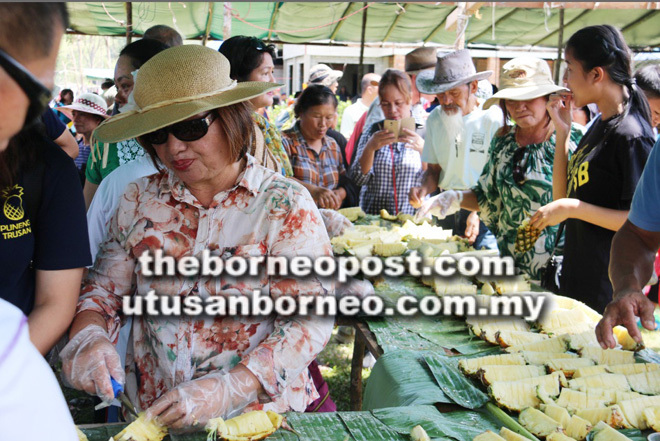 Organising chairman Langub Meripa told thesundaypost the main objective is to promote Puneng Trusan’s agricultural produce, mainly pineapples, to not only Lun Bawangs but others as well. Local handmade handicrafts on sale at the festival. He said as Puneng Trusan pineapples are of high quality, they decided to promote the fruits to the outside world. He added that they were also aiming to promote Puneng Trusan and Long Semadoh – apart from Ba Kelalan – as tourist spots to not only locals but also foreign visitors. Moreover, the JKKK wants to provide a platform for the highland communities to play an active part in agriculture by marketing their produce outside their zone. Langub said everyone in Puneng Trusan cultivates pineapples on a commercial basis apart from their daily job of planting and harvesting rice. Visitors sample Puneng Trusan pineapples. 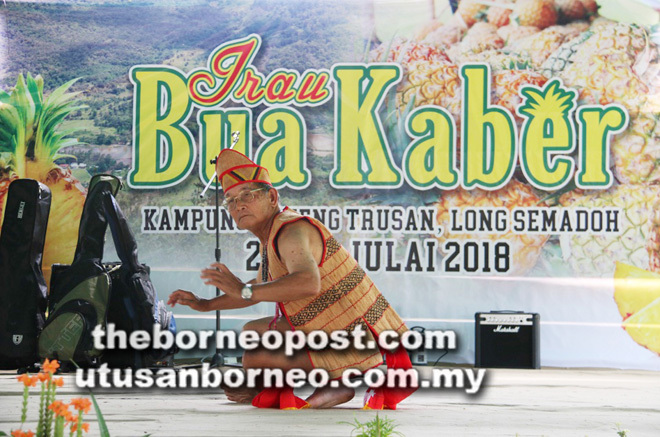 The first Pesta Bua Kaber only drew about 200 visitors, mostly Lun Bawangs themselves and a few from Labuan, other districts in Sarawak, and Brunei. “The first time, we didn’t pull as much of a crowd as we expected but the event went well with the support of the close-knit Lun Bawang community,” Langub recalled. The festival was not organised last year but made a successful return this year on July 21-22. Tourists take photos in front of the pineapple tower. This time round, Langub noted the crowd was much bigger than in 2016. “Over time, I think people have learnt about the festival and they showed up in bigger numbers,” he said. Nearly 1,000 visited Puneng Trusan during the two-day festival. The Ministry of Tourism, Arts, Culture, Youth and Sports, and many government and non-governmental organisations were among the participants. The activities included a pineapple eating competition, local food fair, the biggest pineapple competition, and a pineapple exhibition. Langub said the good response has motivated him and his committee to organise a similar festival next year. 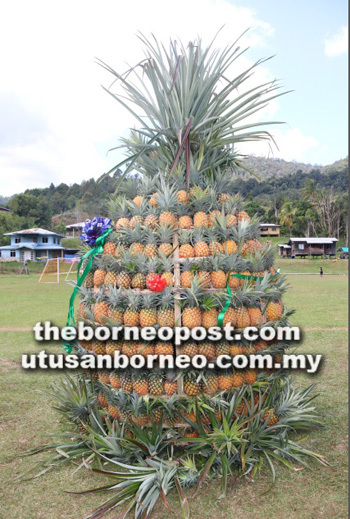 Many have heard of the famous Bario pineapple but they may wonder how the Puneng Trusan pineapple tastes. Langub said there isn’t much difference between the two in terms of size, shape, and especially taste. “I don’t dare compare Bario pineapples with Puneng Trusan pineapples but from the feedback we received, the latter are also sweet and juicy,” he said. The temperature in Puneng Trusan is normally between 22 and 27 degrees Celsius though sometimes, it goes up to 30 degrees Celsius between noon and 2pm. Langub pointed out that the cool climate and fertile soil in the area are the main factors in determining the taste of the pineapples. The peak harvesting season is July – one of the reasons why Pesta Bua Kaber is held in that month. After the harvest, the fresh fruits are sold to the locals while some are sold in Lawas, Miri, and Kota Kinabalu. Puneng Trusan pineapples are sold according to weight – like Bario pineapples. Puneng Trusan headman performs a traditional dance at the festival. Normally, in the village, each Puneng Trusan pineapple fetches RM3 per kg but the price is higher in Lawas, Miri and KK. “Once the pineapples reach the supermarkets or fruit shops in these places, the price (per kg) is between RM8 and RM9,” Langub said. Though more expensive than other pineapples, the Puneng Trusan variety is still much in demand because of its “hard to find” taste, he added. Promoting and marketing Puneng Trusan pineapples come with some challenges, especially for the rural communities facing problems of transporting their produce to markets outside the village. Road conditions and logistics are a constant worry. The journey from Lawas town to Puneng Trusan in Long Semadoh and vice versa takes three to four hours by four-wheel-drive (4WD) vehicle through rugged terrain. The duration of the journey also depends on the weather. If rain further aggravates already challenging road conditions, the journey could take longer. 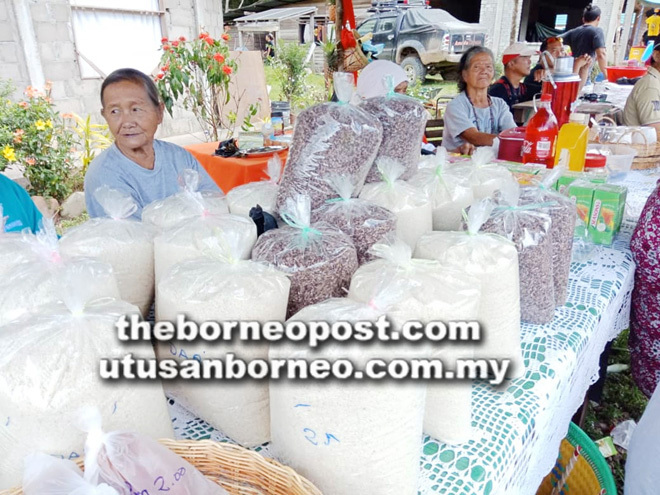 For farmers from Puneng Trusan, bad roads have always been a major stumbling block in transporting their produce to places such as Lawas, Miri, and Kota Kinabalu. However, Langub noted that road conditions weren’t too bad in recent months, allowing more people to travel to Puneng Trusan for Pesta Bua Kaber this year. He hoped Minister of Works Baru Bian, a Lun Bawang from Ba Kelalan, will deliver more development to the area. “I believe everyone in Lawas, especially those from the highlands, have high hopes he will bring infrastructure development such as better roads to the local people,” he said. Lun Bawang women in their traditional attire.